How Big Do Avocado Trees Get? Avocado trees have much to offer as an addition to a yard, with their ability to provide fruit and shade. Anyone who enjoys the flavor of avocados may be tempted to plant a tree or two at home, but the invariable question by someone who has not done so before is, "How big do avocado trees get?" Although it seems like a simple question, it generally ignores the fact that dwarf avocado trees are available. Common avocado trees can grow to anywhere from 40 to 80 feet tall. For those who are spatially challenged, let's take an elevator to the fourth and eighth floors and reach out the windows to pick avocados from the top branches of those trees. For people with small yards, dwarf avocado trees provide a manageable way to grow the fruit in a space that makes sense. 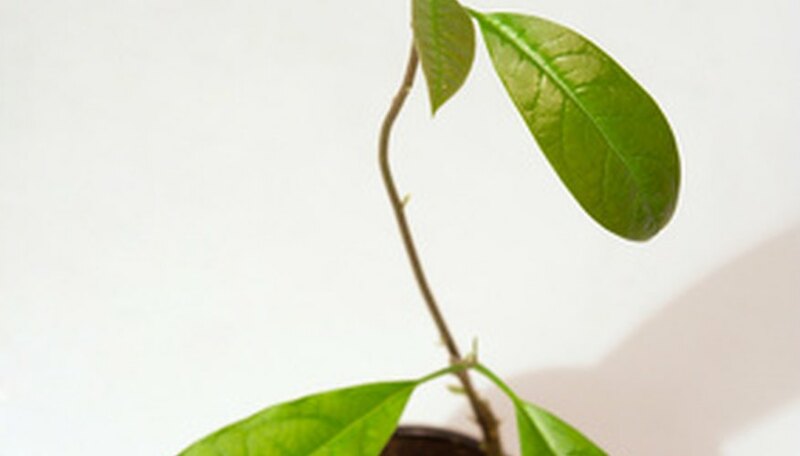 Dwarf avocado trees can grow to heights up to 15 feet. Not all avocados are created equal. There is the typical avocado found at the local supermarket, but other avocados out there rival cantaloupes in size. At Hawaii-aloha.com, for instance, blogger Cindy Scheopner photographed a Hawaiian avocado "large enough to produce an entire batch of guacamole." Fruit from a dwarf tree is similar in size to the typical avocados (usually of the Hass variety) that can be purchased at the grocery store, and may commonly weigh between 8 and 12 ounces. Is that big? Well ... on the whole, avocados will weigh somewhere from 3.5 ounces up to about 2.2 pounds, according to dimensionsguide.com. So the perfect situation leads to the perfect conditions for avocado growth. It's a Hawaiian scene with beautifully draining soil and just enough rain, but also plenty of sun. A tree, after 30 years or so, grows to a height of 80 feet, bearing fruit that is as long as a human head, and weighs 2.2 pounds. This may be the perfect tree with the perfect fruit, but it sure wouldn't be easy to get the fruit down from the top, and it would make a definite impression on those below if it fell to the ground from such a height. Hawaii-Aloha.com: "Avocado Attack in Hawaii"
Wes Fessler has been writing professionally since 1994. His first professional publication was a book of poetry called "Spiritual Thoughts," published in 1996 by Better Half Publications. Fessler holds a Bachelor of Science in criminal justice from Weber State University.